There are many myths that surround using live bait instead of artificial and most of them are not true. Live bait is still used by many anglers. The one factual part of live bait, which no one can dispute, it that is often messy, and it smells terrible. If you can surmount these two factors, you will be in good shape to try live bait on your next fishing outing. There are some basic principles that should not be ignored when using live bait. None of the principles concerning live bait are clean or nice, but they are mandatory. You should never handle live bait when your hands are dry. Bait has a slimy layer on the outside, which is protective as well as inviting to predators, and if your hands are dry you will risk removing that layer. If you are running short on live bait, try to save the bait that dies in your live well or in a nearby bucket. 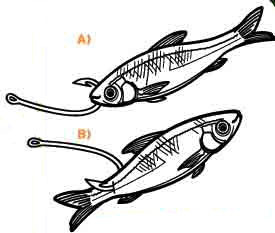 When your live bait has run out, you will still be able to use the freshly dead bait on your hook to attract fish. All you have to do is cast your line and bob it a little to give the appearance that your decoy has some life left. Be careful of the weight that you put on a line with live bait. Fish are going to spot a weight if it is too heavy and weighting down the bait. Your weight or sinker should be light enough to give the bait the appearance of free floating in the water. Seasonal fishing can change the perspective on live bait. For instance, the summer months can be brutal, especially in the South. You may need to adjust your thinking and practices when the summer months hit. Keeping the bait alive will be the hardest obstacle for any angler in the summer. In order to keep your bait living, you will need to change out the water regularly so that the oxygen can keep flowing through to the bait. However, you can't just stop at changing out the water. The temperature of the water is crucial because the water on the surface is hot and deadly for living bait. Therefore, having ice on hand to put into the live well will be the most beneficial way of keeping your live bait happy until they reach the hook. There is also a bait shortage during the summer months on things like shrimp and live croaker. You will save yourself a lot of time if you call the bait shop the night before to ensure that the bait you want is available. The shrimp are the most common bait in the summertime, but they are not as effective as you may think. When everyone is using shrimp, the fish are not as excited by them because they see them everywhere. Try using a baitfish that is not as often used in the summer months and guarantee a better chance of catching a fish. Some other tips you should keep in mind when fishing with live bait is to never hook your live bait in the eyes. The reason is that you want the bait to see the fish approach them because they will become more excited and it will cause the fish to latch on better. Another thing is that you should add water softener salt to the water that is holding your live bait. The salt will make the scales of your bait harder while instantaneously preserving the slimy coat that attracts predators. Lastly, you should make sure that you know how to properly throw a casting net before trying to catch bait. People often times throw the net too hard or too soft and this results in frustration and a net that does not consistently open. Live bait can come in handy when you are trying to have a big day out at sea. Reason and logic will tell you that a fish would be more attracted to real food as oppose to faux food. However, the live bait does increase the workload so make sure you are prepared to deal with the entire package before committing to fishing with live bait. Using live bait can pay off when fishing and so it should always be a plan B when fishing. - Enjoy!!! !